Rarely do I choose to write here about the actual mechanics of vegetarianism, mostly because I don’t like labels and definitions and because I figure that people can work things out for themselves. But my own journey through the process of adopting healthy living, along with my recent readings on the subject and the varied experiences of my friends who have tried vegetarianism has led me to break my silence. Countless studies, carried out by the most prestigious universities and hospitals around the world, including Harvard, Yale, MIT, Cambridge, Cornell, The Cleveland Clinic and others, have determined that a vegetarian or vegan diet is the most health-promoting, illness-preventing and even sickness-healing diet that humans can exist on. For more on this, read The China Study by T. Colin Campbell and Healthy at 100 by John Robbins, I assure you that your reading time will not be wasted. Now, that all being said, it must be noted that these studies are testing and making their claims about healthy vegetarianism, not junk-food vegetarianism. But what do you mean? How can vegetarians be unhealthy? Well, the answer comes in two words: processed foods. Admittedly, if you are a vegan, you are automatically less likely to eat junk foods because they often contain a plethora of non-vegan ingredients. But, especially for people in the process of transitioning from the S.A.D. (Standard American Diet) to a vegetarian or vegan lifestyle, the benefits posed by “products” in the vegetarian section of your grocery often outweigh their inherently processed nature. These foods allow us to move into a vegetarian lifestyle without feeling so deprived that we throw up our hands and return to full-blown meat-eating. The problems come when we begin to rely on these products as our main source of food, and we keep eating them well into our adoption of the new vegetarian lifestyle. 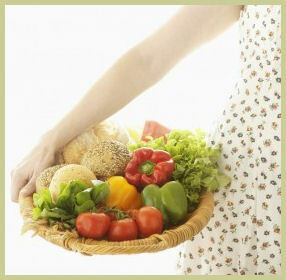 A healthy vegetarian lifestyle is comprised of lots of fresh vegetables, whole grains, fruits, seeds and nuts. If you are vegetarian you may also insert small portions of eggs, milk, yogurt and cheese. (I am a vegetarian who doesn’t eat dairy, but I do eat eggs.) Does what I’m saying here mean that you can’t have faux-meat products, or cake or pasta? No. What is does mean is that the BULK of what you eat should be coming from whole foods, whole grains and fresh fruit and veg. If you fall into a pattern where you are eating large amounts of cake, pasta, breads and processed foods, than I am sorry to tell you that you are not eating a healthy diet, despite your avoidance of meat, and will likely pay for it with decreased energy, excess weight and long-term health effects. To truly reap the short-term and long-term benefits of a vegetarian lifestyle, you need to be eating a diet comprised at least 90% of whole foods, not processed ones. Contrary to popular opinion, it has been proven by high-quality science that vegetarians and vegans who eat a whole foods, vegetable rich diet do not need added iron or protein supplements, and may only occasionally need a B12 supplement. But, people eating more mainstream diets tend to need supplementation on essential nutrients while having an overage of nutrients that our body can make on it’s own, thus leading to a feeling of unwellness, an imbalanced immune system, food allergies and greater health problems. The healthiest peoples on this planet eat 10% or less of their diets as protein, while Americans tend to eat ridiculously more, 2-3 times as much. If we, as vegetarians, consume lots of eggs, dairy and “fortified” foods we may still not be eating a healthy range of proteins and nutrients. The bad news is that when we eat more proteins than the body needs, we have a higher likelihood of heart disease, cancers and Alzheimer’s disease. The good news is that this is only true of proteins derived from animal sources. We can overeat on plant proteins all that we want and the adverse effects never appear. Ideally, only 1% of your diet should be comprised of animal-based proteins, and 4-9% of plant-based proteins. For myself I choose to be a Mindfultarian, I remain mindful of the nature of my foods and don’t shun, but simply choose to minimize, my ingestion of non-organic vegetables, overly processed products and dairy and produce that have come from nameless, faceless farms thousands of miles away rather than family farms in my own back yard. I will proudly say that I have used vegetarian products to help me transition to, and remain faithful to, a vegetarian diet. I believe that being able to enjoy something which looks and/or tastes like an old favorite food can be just the emotional/psychological boost that new vegetarians (and even long-time ones) need from time-to-time. That is why you will find some “faux” products in a few of my recipes, I have a special knack for “recreating” S.A.D. foods using vegetarian ingredients and I do take requests from friends and family. But, what I do not advocate is feeding yourself, or your children, on these “products” too frequently. Make whole foods your main source of nutrition and processed foods your occasional special treats. Keep your occasional moments down to one or two a month and your health will reap all the fantastic benefits of being a vegetarian. I know that people, especially young people, who become vegetarians are often existing in a bubble, meaning that they are the only vegetarian that they know and therefore have no support. I know that many people, including adults, that are new to vegetarianism have very little, or even no, experience with cooking beyond heating up a frozen dinner or paying the delivery guy. In these cases vegetarian “products” can be a god-send. But, for your health and that of the planet, after you get more comfortable, and have read a bit more about nutrition…in short, after you have decided that vegetarianism is for you, I urge you to be brave enough to experiment with new recipes that use only whole foods. Get to know your pots and pans and your spice rack. Check out free vegetarian cooking videos on YouTube and buy a couple of core cookbooks. Visit an ethnic market or restaurant for inspiration. What you will discover is that there is a whole world of scrumptious and healthy food out there which you never knew existed. Hello from a new vegetarian! Is tofu considered highly processed or “faux”? What about soy products? I am currently experimenting with the vegetarian ways of eating.I usually switch off and on one week at a time until one day, no meat.One of my favorite things to eat, and I do this every day, is a green smoothie.I just blend kale spinach,carrots,apples,pears,squash,zuccini,bananas,raisins,cabbage raw with distilled water in a blender until smooth.I mix and match with these fruits and veggies. This is a perfect way to incorperate raw foods into your diet.